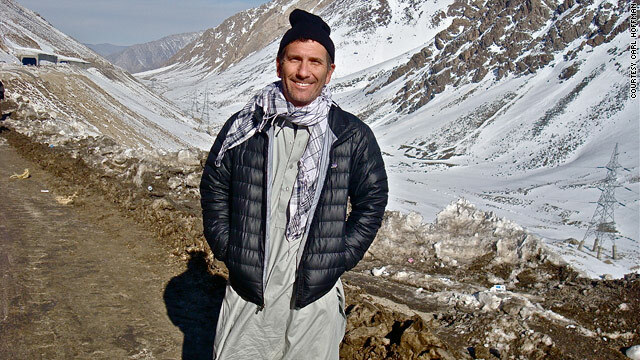 Carl Hoffman dressed in local garb for his bus trip across the Salang Pass in northern Afghanistan. EDITOR'S NOTE: An earlier version of this story generated many comments and questions about how it was determined whether an airline is considered more dangerous than others to fly. A follow up story found there is no consensus on how to rank airlines for safety. So, we have edited this story to remove references to specific airlines. (CNN) -- For two decades, Carl Hoffman had been a stable husband and father, he writes in his new book, "The Lunatic Express." But then he snapped. A journalist by trade, he wanted to go away and see the world's "messy heart." So in 2008, Hoffman, 49, embarked on a five-month trip using modes of transportation that many leisure travelers would avoid at all costs but that many people around the planet board every day. He flew on airlines others might view as risky, endured 28-hour trips on buses prone to plunging off cliffs in South America, took overcrowded ferries in the Amazon and Asia, and survived sweltering trains in Africa. Hoffman recently talked with CNN.com about his quest. The following is an edited version of that interview. CNN: You flew on statistically risky airlines. How did you feel on takeoff? Carl Hoffman: I'm sort of a fatalist, I guess. I thought that I would be OK. I hoped that the plane wouldn't crash, and one of the funny things is that airline travel is pretty safe. Even on really bad -- statistically bad -- airlines, the death rate is really much lower than, say, driving on the New Jersey Turnpike. It was a numbers game, and I sort of thought, 'well, this time it's just not going to happen,' or at least I hoped it wouldn't. CNN: Did anything out of the ordinary happen? Hoffman: No, the flights were pretty routine. CNN: You had so little personal space in many of your journeys, especially during your trip on a ferry in Indonesia, where you were surrounded by people and "millions of roaches." Did you ever have a breaking point where you just wanted to leave? Hoffman: I never did. But at the end of those journeys, I always was almost desperate to get to a hotel where I could have my own bed, be by myself and have a cold beer. We tend to think of affluence as the acquisition of objects, but I realized that what makes us so rich in much of the developed world is cleanliness and space. I'm sitting in my relatively small apartment right now, and I'm the only one in it, and that's something that many people in the world will never experience. That's what struck me on my trip: I would go days never being able to be alone. It almost drove me crazy. Having people's hands or legs flop on me, I would be incredulous. That's my space. But much of the world has no space. CNN: On the Indonesian ferry, you ate meals of "rice and a fish tail." What was that like? Hoffman: Your passage in steerage included two meals a day, and there'd be a huge, long line, and they'd just hand you a Styrofoam container, and in that container was just a pile of white rice and either a fish head or a fish tail. There's a little meat there, and you pick away at it, and you get a little package of hot sauce. CNN: Physically, how did your body take the cramped conditions, the pollution and the heat in some of these countries? Hoffman: The only time I got sick was in New Delhi, India. I had some friends who were diplomats and journalists, and I stayed with them in their fancy apartment, and they took me to a fancy dinner party, and I got sick at the dinner party. Other than that, I never got sick. I ended up eating everything, drinking tap water in Mumbai and Kolkata. I think, physically, the Indonesian ship [where I slept on a plank] was probably one of my hardest legs. I was really sore. I'm kind of bony, and every bone in my hips, my shoulders, my elbows, my ankles was bruised. On some of the South American buses, I rode way too long, and my body was cramping up, but there was nothing to do about it, so I just tried to Zen out and go into sort of a dream state. CNN: Did you ever fear for your life? Hoffman: Never directly. In Afghanistan, I was kind of nervous, [but] the longer I was there, the less scared of it I got, because you start to understand what the situation is. CNN: How do you book a hotel in Kabul? Do you just go online? The security is very tight; there are multiple walls and gates and people with machine guns guarding you. It was expensive and a big target. I actually moved to a much smaller local hotel that had much less security but was also much less of a target and much cheaper. CNN: In Kabul, you met a French woman who has been traveling to Afghanistan, Pakistan and Yemen by herself. How does she do that? Hoffman: She just does it. The world is more available than we like to think it is here. She pulls on an abaya. She dresses in black and a head scarf and puts a knife in her bag. In Yemen, she said, she carried a little pistol. CNN: Do you think a woman could do the same journey you did? Hoffman: Yeah, of course. I don't want to minimize the challenges that a woman faces, but the French woman was clearly doing things way wilder than 99 percent of what I did, and she was fine. There are bold women traveling around the world all the time. CNN: The New York Times book review basically called you an adrenaline addict. Do you agree with that? Hoffman: No, I took issue with that. I think I'm curious. I'm a journalist. I want to know and understand the world, and I think to do that, you have to go outside your comfort zone sometimes.